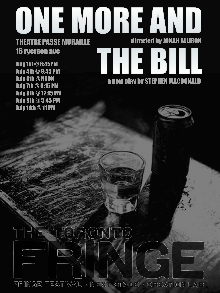 One More and the Bill from Little Boy Lost transforms Theatre Passe Muraille into Dorian Gray’s Hotel California at this year’s Toronto Fringe Festival. Having uttered the title phrase on more than one occasion, I was eager to see this production and my expectations were rewarded with a thoughtful, funny and emotional performance. One More and the Bill examines the life and characters inside a bar with seemingly mystical properties. Throughout the performance I was intrigued by the direction of each individual story and how they intertwined, weaving a picture of disparate characters who find commonality in the place that fuels their self-loathing but also provides them with comfort. The interplay between Cassidy Sadler’s Woman and TJ Riley’s Charlie is antagonism at its best. It is clear that the reason they find each other so distasteful is not for any other truth then that is how they feel about themselves. It also gave Charlie – the stand out performance of the night – the chance to inject well-placed and well-delivered humour to the proceedings. At moments it appeared the characters break the fourth wall, specifically Stephen Park’s Bartender and Meghan McNicol’s Bride. Because of the aforementioned mystique of the story it made me question if there wasn’t more going on than just playing with narrative technique. The musical selections for the show expertly accompanied the piece with Louis Armstrong chiming in at the perfect time, just as Charlie was sharing a moment with his first love, a bottle of whiskey. The intro music also set up the scene well as the audience shuffled into their seats. There were a lot of moving parts to One More and the Bill and at some points those parts overlapped so as to muddle things for a moment, but that is what happens in a bar. Music is played, drinks and conversations had and sometimes words get lost in the mix. Nothing pertinent was dropped, however, as the actors kept things moving smoothly. One More and the Bill plays well with the definition of a bar and the characters one can find haunting the stools. I was left with questions after leaving the theatre, but they were the right questions. Who exactly is the bartender? What is the “magic” behind this space? Will Charlie ever go back to Fenway Park? It is no question that One More and the Bill was a great, entertaining experience and even if you have never spent time in a bar, this one has some space specifically for you.